Sun sets after a fun late afternoon carving session. The complete comes set up stock for more of a slalom/carving ride. It comes with Gullwing Charger 9″ trucks and Arbor Slalom Series 72mm 78a lipped wheels. This setup is quite fun for quick carves, not to mention it pumps phenomenally well too. I’d prefer this setup on a minor incline grade hill more than for flatland or really steep grades. Since I wanted to put the board through its paces I tested a few different setups after running the stock setup for a week or two. Experimenting with different setups. The coffee has to be there! For this purchase, I originally wanted wider trucks so I put on some Paris 180. I was going to be riding flat land for a bit so I combined those trucks with a set of Orangatang Durian Purps. Those Potangs are 75mm and 83a and roll a bit faster than the Arbors on the flats. No matter how loose I ran the trucks, there was no wheelbite. Good news, ’cause I like them real loose. For bushings I chose to run double barrel Venom SHR; a 87a on the top and a 88a on the bottom. Again, only tightened to stop slop. I’m really enjoying that setup as I prefer wider trucks. Pumping is a little bit harder than with the narrower trucks though. On steeper grades or when I want I bit more grip for cornering, I switch out the Durians for the Arbor Slalom wheels which I must say are pretty darn awesome. Recently, I’ve also run some Abec 11 Classic Freerides Amber, 81a. Those wheels give me a middle ground of rolling resistance on the Assault and they slide incredible well and very quietly. Releasing the back of the board after an deep and powerful carve is also very fun and predictable on the Classic Freerides. For tricks the tiny nose and tail are enough of a platform, although coming from top-mounts, my big feet are not used to using the nose/tail with the truck bases right smack in the way. I’m getting there though. Stopping for a rest in front of the Bellagio in Las Vegas while skating at dawn. Finally, the graphics are very nice. Black and gold kind of goes well with just about anything. 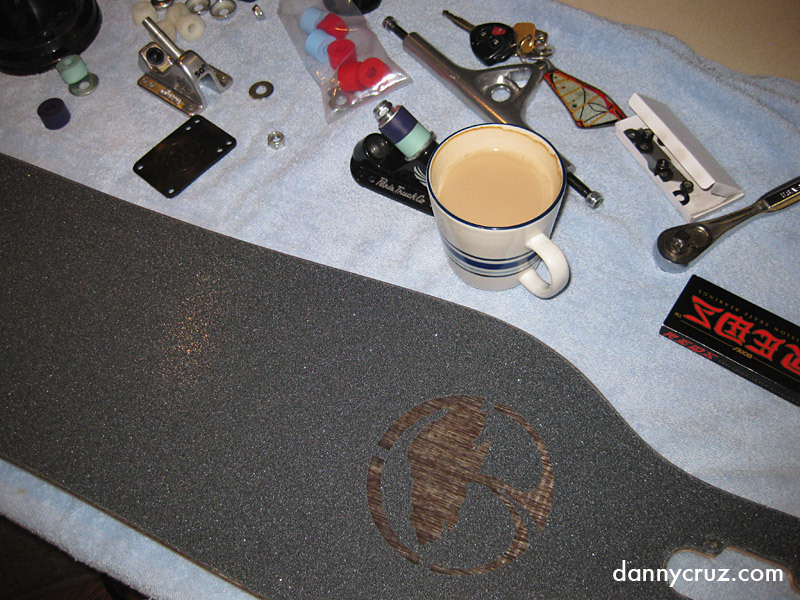 The cutouts, grip-tape job and finish were all done to perfection as well. The one thing I would point out is that Arbor markets the board as an “advanced downhill design” and with all due respect to Arbor and their amazing products, while the Assault can easily bomb the gnarliest of hills, it is not a downhill specific board due to the flex and camber. However, the flex and camber make it a dream to push around and pump. On a recent business trip to Las Vegas, I woke up at 6am before the crowds hit the streets (everyone’s likely hung over) and pushed the Assault all over the strip. 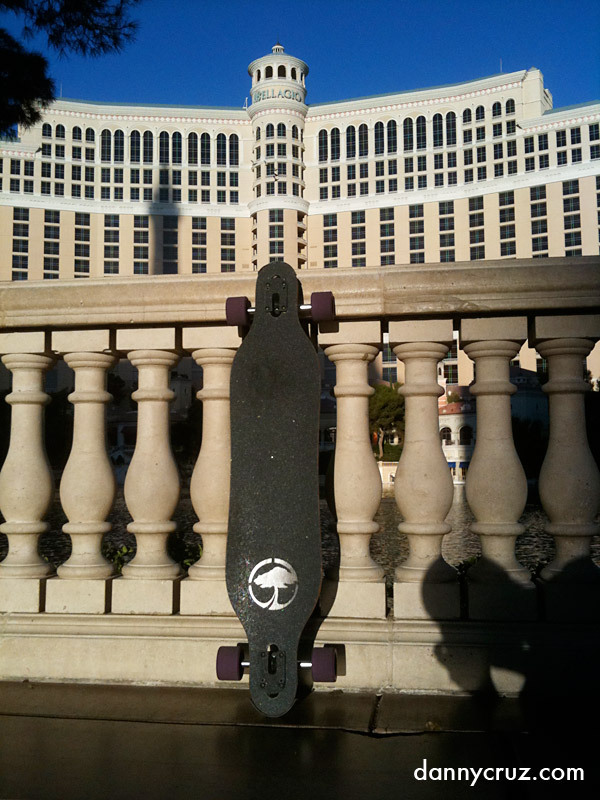 On my way back, between Caesar’s Palace and Hard Rock Cafe, I found some really slick shiny concrete that was tons of fun to slide on. Overall, I’m extremely happy with the longboard and it’s going to be in my quiver until it dies. Looking forward to get out on it today. Again! Where to Buy: I receive constant emails about where to buy the Arbor Assault. Here’s one I would recommend to buy from. Of course, the one’s on sale now have different graphics. But as far as I can tell, that’s it. great review dude I just but my arbor assault is still not here but soon will be. How do you like the board so far Mauricio? yo i got this board for christmas and it is amazing. though it is my first board, i don’t plan on replacing it anytime soon, except for maybe the trucks, since i’m still running the stock setup but with otang purp stims. still trying to get the sliding down, but i think i’ll get there once all this snow goes away from the east coast….. any tips on sliding bro? Just got the Assault. So far i Love it. Was thinking of getting the Pairs Adam Coltons for it. What bushing kits do you get? Is there a master kit to mix and match? Also looking at your pic with the parts id swear you stole my car keys! I have a Rav4 (same key) with a Sailworks key chain with only 2 other keys! (not something you see everyday) Great Review Danny. Hi Mike, Haha. Wow, I’ve had that windsurf sail keychain for years! Mine’s Ezzy. Apparently the key seems to be the same for a lot of Toyotas and Scions. But anyway, back to the board. I’m running Paris 180′s currently (same as the Coltons). I definitely recommend those. As far as bushings go, I was running Venoms SHR Sea Foam with a regular Venom Purple. Both barrels. But recently, I switched those out to stock Paris red bushings, barrel/cone and I’m loving it for slow speed stuff which is mostly what I do. I’d say, experiment with different bushing setups. Thanks for the comment and props on the review. Enjoy your board. Sweet! I’ll order up some bushings to go with the trucks. OH, My keychain is Ezzy too, I made a mistake None of my sails are the same brand so guessed without looking. Danny, I got my Paris 180′s and Durain wheels yesterday. All i can say is wow what a difference! It’s so much fun to just carve up the street and make super tight turns with no wheel bite. I ended up going with the black and silver trucks and not the Coltons as i thought it makes a nice contrast. I took the kids to this 3 mile loop at the park and we had a blast. Of course my 9 year took over the arbor and i got stuck riding his trick board with tiny hard wheels which was not fun after my feet turned numb from the vibration! Take care man. What kind of board would you perfer for flat land? Beacause im a begginer and i dont wanna mess with down hill . so i wanna know if this board is good enough or should i start out with a diffrent board? This board is excellent for flat land. The flex and the somewhat shallow concave make it excellent for messing around the flats and pushing. The kicks are long enough for flat land tricks too. I think you would be very happy with it. Thanks Danny, now i know thats what i want. Hi Jordan, my very first longboard was a Sector 9 Goddess pintail. My wife got it for my b-day like 5 years ago. It’s undergoing a full restoration at the moment. As far as the Assault is concerned, there’s absolutely nothing wrong with riding it stock. Don’t worry about changing trucks or wheels. Burn through what you have. In fact, the only thing you really need to do right away will cost you about $15. That would be replacing the stock truck bushings and adding spacers between the stock bearings. That’s all. 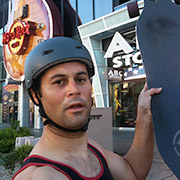 There are plenty of shops online to buy that stuff from, but I recommend either Muir Skate or Longboardskater.com. yeah i have the apex 37 and i like it alot but i just have more fun and its a better ride on the assault and yeah i just orderd new parts from origanal so cant wait! I’m wearing through my purple durains practicing getting my slides down. Have you ever tried the yellow durains? Do they slide out from under you? I have my toe side slides wired. But still dont havent tried heel side or coleman. Hey I just ordered the assault with 90a wheels but I am going to get otangs soon, what do you suggest for sliding wheels??? Thanks for the review also, best review of assault out there. This is what convinced me to get it!!! hey man im am about 5 feet tall and 90 lbs is this board gonna be too big???? There’s no TOO BIG in longboarding. The board is going to feel stiffer for you but as long as you set it up right, with softer bushings for your weight, you are going to be golden. hey thanks I really appreciate it and what is the most reputable site to get this board from? Talk to Scott at Muir Skate or Brad at Longboardskater.com. I don’t think Brad carries Arbor, so Muir is your best bet for this one. Enjoy! PS: I don’t get any commissions for sales or anything like that on these boards BTW. At least not yet! sweet thanks it is ordered!!!!!!!! Hi Preston B, I bet you’ve received it by now. How are you liking it? Hey I just acquired an Arbor I’ve been skateboarding for a while but just recently got into longboarding. I like carving, slide and being able to pump. what set up would you recommend? I bought it with Gulling Wing Charger 5.0 trucks, arbor salom series 72mm 75a wheels. Thanks! Im definetly interested in buying this board, and im really looking foward to getting it. I want to learn how to slide, and i cant do that on my sector 9 ala moana, and i want to get the right wheels and bearings and everything. i was planning on getting paris 180 trucks, orangatang stimulus yellow, but bushings, bearings, i have no idea. could you help me out? im looking for a set up thats good for speed, sliding, and control. Hey and greetings from germany! 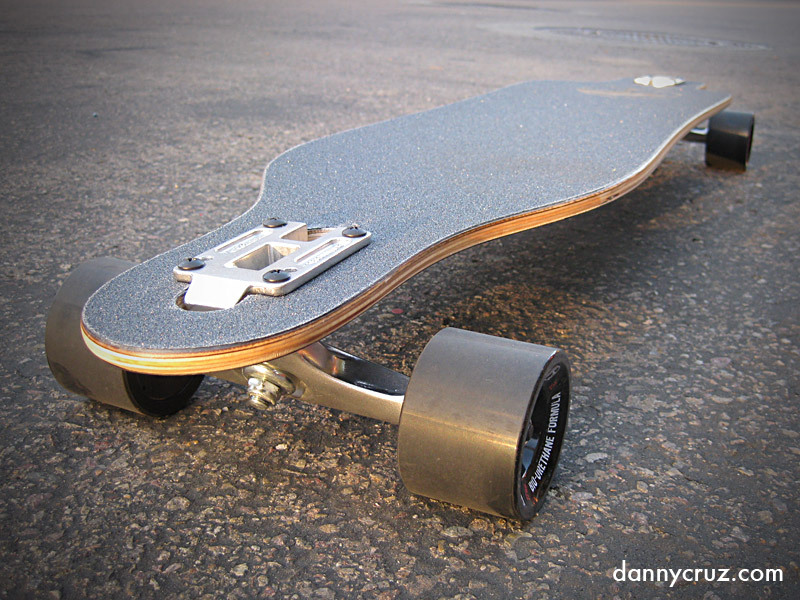 My question: Is it possible to use Randall II trucks on this board? Previous post: Rip Curl Pro Search 2010 in Puerto Rico!